The Atlanto-Scandian herring fishery began about one thousand years ago (Seliverstov & Seliverstova, 1991). Traditionally, the main fishery of adult herring had been a winter fishery along the Norwegian west coast prior to and during the spawning season. 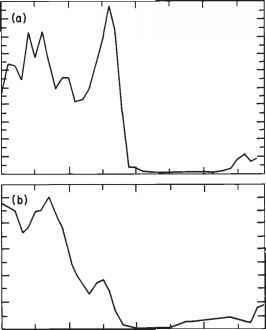 Available data show that periods of rather sharp fluctuations of catches occurred in the nineteenth century (Fig. 11.3). Gradual increases of catches occurred during the period 1810-30; from several hundred metric tons in 1810 to 70,000 metric tons in 1830. In the 1860s annual catches exceeded 100,000 metric tons followed by a sharp decline in the 1870s. In the 1880s and 1890s the annual catches totalled only 13,000 metric tons. With decreases in winter adult herring catches, the fishery of immature (fat)* herring of two to five years and of young herring of zero to two years began to develop in the late 1890s and in the early 1900s. This fishery took place along the Norwegian coast in the fjords of northern Norway and in the Barents Sea along the Russian coast. At the beginning of the twentieth century the winter catches began to increase. An extremely strong year class appeared in 1904 which formed the base for 10 years of high catches. * Fat herring means immature herring of two to five years of age in earlier decades and two to three years nowadays, caught in the fjords of northern Norway. Fat and immature are used here synonymously. Other important fisheries were in summer and fall on the feeding grounds along the Polar Front to the north and northeast of Iceland. Usually, the fishery season extended from June to September and, until 1950, the stock was mainly exploited by Icelandic and Norwegian vessels. Development of mainly the winter herring fishery in the early 1900s was associated not only with increased strength of year classes at that time but also with advances in the utilization of herring for reduction to fish meal. Until World War I, all of the herring catch was used for human consumption but after the war, fish-meal processing plants began to develop. In fact, by the 1940s, about 60 percent of adult herring catches was used for those purposes (Seliverstov & Seliverstova, 1988). Ten rich year classes in the first half of the twentieth century accounted for approximately 70 percent of the Norwegian catches. Those were the year classes of 1904, 1918, 1923, 1930, 1934, 1937, 1943, 1944, 1947 and 1950. According to Marty and Fyodorov (1959), during the period 1923-50 relatively strong year classes appeared about every seven years. The sharp rise in catches of Norwegian spring-spawning herring began after World War II, reaching 1,000,000 metric tons in the early 1950s. In 1954 and 1956 the total annual catch exceeded 1,500,000 metric tons. The Soviet fishery of Atlanto-Scandian herring began in 1950 as a summer fishery on the feeding grounds in the Norwegian Sea (Ponomarenko & Seliverstov, 1989). All the Soviet vessels were drifters. Since 1952, a fall and winter herring fishery developed along the migration routes of prespawning herring (Marty & Yu-danov, 1962). Soviet vessels also exploited immature fish in inlets and bays along the Murman Coast. Most of the herring landings were used for food (curing). Herring processing in Norway differed from that in the Soviet Union. In Norway, most of the fish, including small immature herring, were reduced to oil and fish meal (Seliverstov and Seliverstova, 1991). Only a small part of the immature herring landings was processed for delicatessen products. Norwegian catches of immature herring in coastal waters and fjords have increased considerably since 1951. In the first half of the 1950s the Norwegian spring-spawning herring stock was at a high level of 8 million metric tons. In 1957 it reached a peak value of 10 million metric tons and then sharply decreased to about 3 million metric tons in 1963 (Anon., 1978). With this decline, the main source of its exploitation was lost to the Norwegian fishery, resulting in a serious economic crisis. The number of vessels significantly declined and fishermen were forced to find new ways to increase efficiency and reduce the costs of fishing. Norway carried out a technical reconstruction of its fishing fleet, as Iceland had done some years earlier. In the early 1960s, the two-dory system was replaced by the ring-net technique using power blocks. This allowed for a reduction in crew size by half. In addition, the new equipment was less affected by weather, allowing the fleet to operate much farther offshore. The development of hydroacoustic equipment was also of prime importance for the herring fishery (Dragesund et al., 1980). These factors resulted in a sharp increase of catches, mainly through Icelandic efforts in the 1960s. In 1966, when the total catch of adult herring reached its maximum, the Icelandic share was 40 percent, whereas the USSR and Norway accounted for 29 and 26 percent, respectively (Table 11.1). The Faroes and West Germany caught the remaining 5 percent. Total catch (in thousands of mt) of adult and pre-recruit Norwegian spring-spawning herring, 1950-71. It should be noted that changes in migration routes during the 1960s greatly affected the location of summer and fall fisheries. They practically ceased off Iceland and relocated in shelf waters south and west of Bear Island and Spitsbergen. Fig. 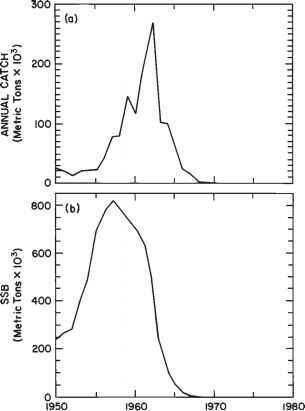 11.4 Norwegian spring-spawning herring, (a) Total catches, 1950-1988 (from Hamre, 1991 and Anon., 1990a), and (b) estimated spawning stock biomass (from Hamre, 1991). During the 1970s and the 1980s fishing was restricted, and the spawning stock of Norwegian spring-spawning herring slowly increased, reaching about 650,000 metric tons by 1984. When the strong 1983 year class was recruited to the spawning stock, its biomass rose to 1,360,000 metric tons in 1988 and 1,500,000 metric tons in 1989 (Hamre, 1991). mer. Sometimes Icelandic spring spawners were caught together with Icelandic summer spawners and Norwegian winter spawners. Mixed catches were divided among three herring stocks by means of biological criteria - mainly by fish-scale type. 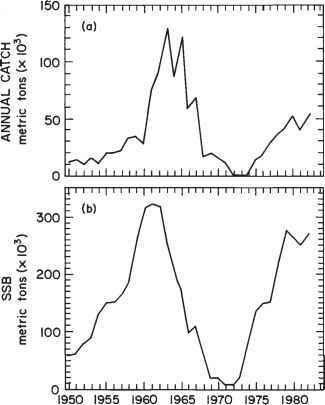 In the early 1950s catches were at a very low level but, with the introduction of sonar and powerblock purse seining in the late 1950s, catches rose quite sharply (see Fig. 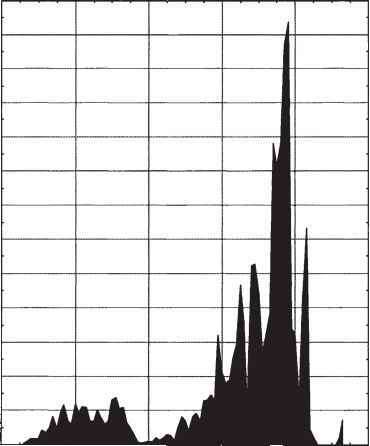 11.5) to a peak of about 280,000 metric tons in 1962 (Jakobsson, 1980a). A rapid decline in catches then followed until an almost total depletion of the stock by 1968. During the 1950s, fishing mortality was very low, allowing the spawning stock biomass to increase rapidly due to good recruitment. Since that time, increases in fish mortality as well as a complete change in recruitment were observed. This change in the state of the stock occurred before any regulatory measures came into force. The sharp decline in recruitment in the late 1960s seems to have been prompted by the deterioration of environmental conditions (discussed in the next section). The annual catches of Icelandic summer-spawning herring varied from 20,000 to 30,000 metric tons during the 1950s and 1960s (Fig. 11.6). Development of sonar fishing and the powerblock resulted in a rapid rise in annual catches which exceeded 100,000 metric tons in the early 1960s. Recruitment was stable and high in that period, and the stock size increased to about 300,000 metric tons in 1960.
ulatory measures contributed considerably to the stock. Later, continued good recruitment resulted in the rapid recovery of the Icelandic summer-spawning herring stock which reached the level of the middle 1960s. In the early 1980s annual catches totaled 45,000 to 50,000 metric tons.